6 x 1.42" high digits. Time, Date & temperature indication, selectable with toggle option. 1 sec. resolution chronometer with lap function. Count down function to a specific date, the last day H:M:S are displayed. Scoreboard function (two players or teams, count up to 199). Random generator from 00 to 99. 2 digit dice. Count function. Chime beep option. Relay output for temperature control or time alarm. US or Europe display option for time, date, degrees Celsius or Fahrenheit format. All functions and settings are wireless remote controlled (wired remote is possible). Optional enclosure type B8009 (special order item found HERE). Optional extra remote control type K8059. relay output: 1A / 24V max. 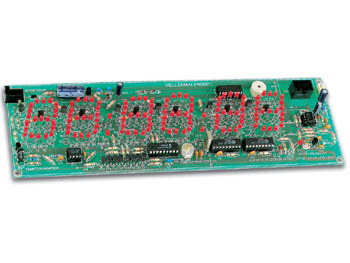 PCB dimensions: 10.0" x 3.2"
Notify me of updates to MULTIFUNCTIONAL CLOCK KIT, temp/countdown/scoreboard/etc..